A business card case for the smooth operator! 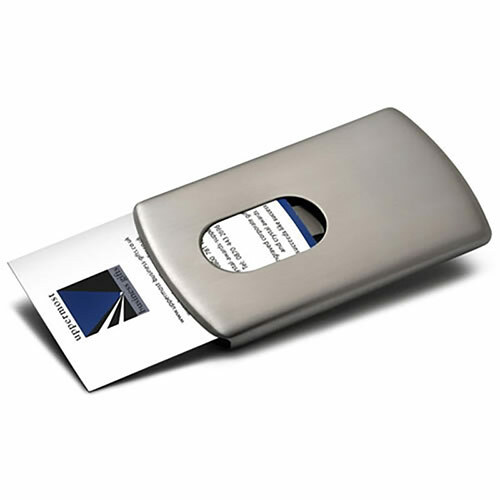 These sturdy metal business card cases feature a window in the lid to allow cards to be easily pushed out of the case when needed. The slimline design fits easily into a pocket or purse, keeping your business cards in crisp, pristine condition. Each case holds 10-12 standard business cards. The exterior of these metal cases is finished in stylish and durable brushed metal and is ideal for engraving. Remember, we offer free engraving of text and logos so you can customise these business card holders with a company or brand logo at no extra cost. We also offer bulk order discounts (see price matrix, above) and low fixed price UK delivery.